Reflective practice in the sporting environment as a concept has been defined by Huntley et al (2014), as ‘a purposeful and complex process that facilitates the examination of experience by questioning the whole self and our agency within the context of practice’. They then went on to define a specific outcome of reflection, ‘this examination transforms experience into learning, which helps to access, make sense of and develop our knowledge in order to better understand and/or improve practice and the situation in which it occurs’. Reflective practice in sport and coaching as a concept has been borrowed from a number of other academic disciplines. Knowles et al (2007) suggested that most of the systems used within sport are drawn from various academic areas such as education, psychology and medicine (Cassidy, Jones, and Potrac, 2004; Peel et al, 2013; Huntley, 2014; Knowles et al, 2014; Threlfall, 2014), with most of the foundational research in this area initially being drawn from the work of Schon (1983; 1987). Reflection can be carried out in two settings on-action and in-action. Reflection-on action is defined as ‘reflection that occurs outside the action present’, with reflection in action referring to ‘reflection that takes place in the action present’ (Gilbert and Trudel, 2001). These two different types of reflection can greatly affect the outcome of the reflective process. The use of reflective practice in sport has been investigated with a key emphasis being place on the use of using it as a learning tool (Peel et al, 2013). This was further emphasised by Culver et al (2012) who saw the use of reflective practice as a method to improve the practice of coaches and better understand of the holistic nature of the coaching process. Threlfall (2014) made this point clearly in that in order to learn and develop we need to understand where the faults lye. The idea of reflection has then been applied to coaching practice in a small number of sports, such as Rugby Union (Burt and Morgan, 2014), Rugby League (Rowley, et al, 2012), Triathlon (Faull and Cropley, 2009), and sport in general (Cropley et al, 2012. Huntley et al (2014) discussed that with many of the theories on the use of reflective practice in sport being drawn from other academic disciplines, is the theory drawn upon truly transferable to the world of sports coaching? This is one of the current issues with reflection in sport, in that there is a lack of longitudinal studies in the sporting environment with large enough populations to draw drastic conclusions about its application. This is much needed research as Hickson (2011) and Threfall (2014) stated that for reflection to be effective it needs to follow a structured process, this is not yet generically established and researched within the world of sport. This has drawn this paper towards discussion of the possible issues and barriers that exist to implementation of reflection in coaching in the process of discussing these issues it is hoped that a better understanding of some of the aspects of the reflective process is achieved. There are a number of key issues that affect the use of reflective practice in sport these include; the framing and identification of the problem or dilemma, the language used to describe the dilemma, time constraints, possible conflict, the feeling that the practice is forced, coaching styles and the practice of reflecting in or on an event. Each of these points will be discussed in turn and possible solutions offered. Gilbert and Trudel (2001) spoke of the reflective conversation where reflecting-on and reflecting-in coaching dilemmas were primarily affected by the role frame placed on a situation by a coaches own perceptions and history. They identified that this process was initiated by dilemmas, and the constant cycle of problem identification followed by problem solving back into problem identification was a key part of the reflective conversation. There is also a need to ensure that the problems being reflected on are ones that are within the control of the coach, it can be a common practice to mull over dilemmas that are not within the control of the coach. This will use up valuable time and create more of a worry effect rather than a learning and problem solving process. Reflection may be viewed as a transforming or validating paradigm (Threlfall, 2014), in that the process can be used to transform from a dilemma to a solution making it more of a learning process. Or reflection may be used as a validating process to validate a view point, this may be a more limiting approach as if a coach is only looking to validate a viewpoint they hold rather than being open to all the possible solutions this may limit how much learning can take place. This process requires a level of critical thinking, which is an important tool in the development of a skill (Peel et al, 2013). The effectiveness of this process is highly dependent on the skills and resources available to the practitioner and the level to which they can be objectively be critical of their own and their teams performance (Knowles et al, 2006). Being critical of sometimes deeply held belief systems and questioning of factors that the coach may feel are tenants of the game, requires a higher level of emotional intelligence (Gardiner, 2000). Gilbert and Trudel (2001) identified that the main source of education in coaching is the observation of other coaches, and the critical process may additionally lead to questioning of a coach or their practices who is seen as more knowledgeable or a leader in the sport. This can create conflict within a coaches core values and sometimes lead to them questioning the coaching system they have been brought up with. This is a practice that is often hard to achieve, as being self-critical or critical of others requires a level of openness to conflict. This brings a major question to light, is the reflective process only for use in a dilemma or problem-solving situation? Dixon (2013) discussed how reflection should look at both positives and negatives, with the coach trying to identify the reasons for both. This may help to lead to an element of benchmarking of good practice that can be then discussed with the team. There are initial challenges faced by coaching staff in that in order to reflect the coach needs to correctly identify dilemmas or problems to initiate the reflective conversation. The whole process can be underlined by the coach’s ability to decide upon what is classed as a critical incident. This is clearly affected by the coach’s perceptions, history and viewpoint of how the game played out. If the coach does not choose appropriate events or chooses to focus on everything rather than defined issues their ability to drawn effective and actionable conclusions from the reflective process can be affected. Gilbert and Trudel (2001) saw this differently, in that by reflecting on individual issues there is a chance that this may lead to omitting to look at how these issues interact with performance as a whole. Peel (2013) discussed how the language used to describe an event can have an effect on conclusions drawn, more positive framing of a situation leading to more positive conclusions being drawn. Dixon (2013) also identified the tone in which reflection takes place having a major impact on how effective it was, with a search for problems that may not always be there being a less productive form of reflection. He suggested reflection should be encouraged to look at both the positive and negative aspects of an event and learn from both. This is opposed to the typical coaches perception of reflection as a search for mistakes, and by putting a more positive slant on reflection the self-talk experienced by the coach may become increasingly positive. This may have a domino effect to other areas of their coaching and additionally to their view of reflection as a practice. Peel et al (2013) discussed how there was a clear time constraint on coaches that meant that reflection was often seen as a lower priority task. When done properly the use of reflective practice can be intellectually and emotionally draining (Peel et al, 2013). Additionally reflective practice becomes more effective when adequate time is available with the presence of individuals who may hold a higher level of experience or bring a level of theoretical knowledge that outshines the coaches (Cushion, 2006). The time spent with more experienced coaches may open the newer coach to a wide toolbox of solutions to their problems than they currently have. This may also be achieved by peer group support of the reflective process with channels for coaches to discuss with each other problems they are facing and search for common solutions. The lack of time within the coaching environment particularly at lower levels where coaching staff tends to be volunteers may reduce the application of the reflective process, and the ability to work with higher level or peer coaching groups. With the use of reflective practice being included by many coaching organisations within core coaching qualifications, and in many cases a compulsory part of qualification completion. 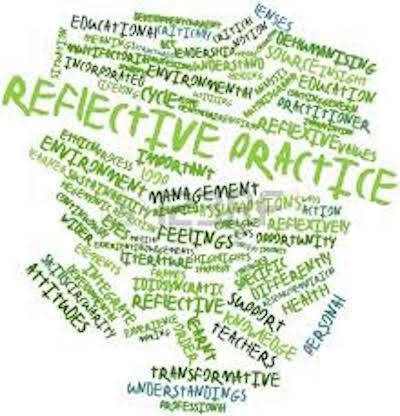 Governing bodies also identifying the use of reflection as a vital part of the coaching process many lead to coaches feeling that they are being forced to reflect and this may detract from the effectiveness of reflection as an exercise (Huntley, 2014). The outlining of the possible benefits to the coach and player in the use of reflective practice may be a way to help the coach feel that reflection is a higher priority part of their coaching skill set. Peel et al (2013) also discussed how the practice of reflection being used more widely in younger coaches with those who would be considered ‘old school’ offering more resistance to a more established method. This disparity was also discussed by Threlfall (2014), he found that the application of reflection at lower levels in some sports was left to the individual coach rather than having a standardised approach or system. This was then linked to if the coach had a positive viewpoint of reflection it was more widely applied and applied with more success. Gilbert and Thrudel (2001) discussed the key difference between reflection that takes place in or outside of the action present. This brings a number of issues, when reflecting in the moment there is the key limiting factor of time. There will only be a limited amount of time before the next play and the next set of reflection needs to take place. This form of reflection can be less effective as the vision of the event created by the coach may be very inaccurate or be highly affected by their perception of the event and how they have mentally framed it. Although there is limited research in the area of reflection in spot, and the various issues identified above Huntley (2014) identifies that there is little evidence that definitively suggests that reflective practice in sport does not work. There is a strong need to conduct greater research to develop a methodology of reflection within sport which addresses the key issues outlined above that may have an effect on its application. With a greater emphasis on longitudinal studies with a larger group of participants. In conclusion in order to support the use of reflective practice in sport there needs to be some level of coach education to help them to initially understand the benefits of reflective practice and how it can aid their and their teams performance. This then needs to move into the identification of the issues pertaining to the game and the coaches own practice, this search should be for both the benchmarking of good practice and also the search for solutions to what would be considered a dilemma or fault. There then needs to be some form of support network that allows access to a peer group that would allow the discussion of issues and possibly interaction with coaches with a higher level of experience that may bring additional tools to the table in the resolution of problems. This all needs to be done with adequate amounts of time being allocated to the process and in an open process that facilitates learning rather than ‘blame’ or conflict. Anderson, A., Knowles, Z. and Gilbourne, D. (2004) ‘Reflective practice for sports psychologists: Concepts, models, practical implications and thoughts on dissemination’. The Sport Psychologist. 18(2) pp. 188-203. Burt, E. and Morgan, P. (2014) ‘Barriers to systematic reflective practice as perceived by UKCC level 1 and level 2 qualified Rugby Union coaches’. Reflective Practice. 15(4) pp. 468-480. Cassidy, T., Jones, R. and Potrac, P. (2004) Understanding sports coaching: The social, cultural and pedagogical foundations of coaching practice. London: Routledge. Cox, E. (2013) Coaching understood – A pragmatic inquiry into the coaching process. London: Sage. Cropley, B., Hanton, S., Miles, A. and Niven, A. (2010) ‘Exploring the relationship between effective and reflective practice in applied sports psychology’. Sports Psychologist. 24(4) pp. 521-541. Cropley, B., Miles, A. and Pell, J. (2012) Reflective practice: Values, issues, and developments within sports coaching. Leeds: SCUK. Culver, D., Gilbert, W. and Sparkes, A. (2012) ‘Qualitative research in sports psychology journals: The next decade 2000-2009 and beyond’ The Sports Psychologist. 26(2) pp. 261-281. Cushion, C. (2006) Mentoring: Harnessing the power of experience. In Jones, R. The sports coach as an educator. London: Routladge, pp. 128-144. Dixon, M., Lee, S. and Ghaye, T. (2013) ‘Reflective practices for better sports coaches and coach education: shifting from a pedagogy of scarcity to abundance in the run up to Rio 2016’. Reflective Practice. 14(5) pp. 585-599. Faull, A. and Cropley, B. (2009) ‘Reflective learning in sport: A case study of a senior level Triathalete.’ Reflective Practice. 10(2) pp. 325-339. Gallimore, R., Gilbert, W. and Nater, S. (2014) ‘Reflective practice and ongoing learning: a coach’s 10-year journey’. Reflective Practice. 15(2) pp. 268-288. Gardiner, M. (2000) Critiques of everyday life. London: Routledge. Gilbert, W. and Trudel, P. (2001) ‘Learning to coach through experience: Reflection in model youth sports coaches’. Journal of Teaching in Physical Education. 21(1) pp. 16-34. Huntley, E. Cropley, B. Gillbourne, D. Sparkes, A. and Knowles, Z. (2014) ‘Reflecting back and forwards: An evaluation of peer-reviewed reflective practice research in sport’. Reflective Practice. 15(6) pp. 863-876. Knowles, Z., Gilboune, D., Cropley, B. and Dugill, L. (2014) Reflective practice in sport and exercise science: Contemporary issues’. London: Routledge. Knowles, Z., Gilboune, D., Tomlinson, V. and Anderson, V.G. (2007) ‘Reflections on the application of the reflective practice for supervision in applied sports psychology’. The Sports Psychologist. 21(1) pp. 109-122. Knowles, Z., Tyler, G., Gilbourne, D. and Eubank, M. (2006) ‘Reflecting on reflecting: Exploring the practice of sports coaching graduates’. Reflective Practice. 7(2) pp. 163-179. Peel, J., Cropley, B., Hanton, S. and Fleming, S. (2013) ‘Learning through reflection: values, conflicts and role interactions of a youth sports coach’. Reflective Practice. 14(6) pp. 729-742. Rowley, C., Earle, K. and Gilbourne, D. (2012) ‘Practice and the process of critical learning: Reflections of an early stage practitioner working in elite level rugby league’. Sport and Exercise Psychology Review. 8(1) pp. 35-50. Schon, D. (1987) Educating the reﬂective practitioner. San Francisco: Jossey-Bass. Threlfall, S. (2014) ‘How elite athletes reflect: An interview with Holly Bleasdale and Paul Bradshaw’. Reflective Practice. 14(4) pp.495-503. Wagstaff, C., Fletcher, D. and Hanton, S. (2012) ‘Exploring emotion abilities and regulation strategies in sports organisations’. Sport, Exercise and Performance Psychology. 1(4) pp. 268-282. Wagstaff, C., Fletcher, D. and Hanton, S. (201) ‘Developing emotional abilities and regulation strategies in a sport organisation’. Psychology of Sport and Exercise. 14(4) pp. 476-487.